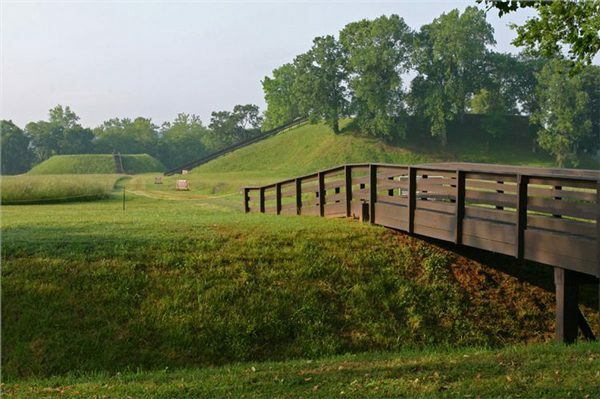 Ocmulgee Mounds: Located near Macon, this large mound group features a restored ceremonial earth lodge as well as one of the tallest earthen pyramids in North America. While the Indian culture thrived here between AD 900-1150, there is evidence of at least 10,000 years of human habitation from the Ice Age hunters to the Creek Indians to an English trading post in 1690. Displays trace the history of the site. Etowah Mounds: The Etowah Mounds, near Cartersville, thrived during the Mississippian Period. A fortified town with seven earthen pyramids, Etowah was the political and ceremonial center for the surrounding area. A modern museum houses one of the best Mississippian artifact collections in the nation and features an audiovisual presentation on archaeology. Fort Mountain: A rock wall zigzags over 900 feet along the slope in the park. This wall of piled native stone, probably related to many other similar structures across the southeast, is from 3-1/2-10 feet high and from 4-1/2-16 feet wide. Archaeologists think the wall was built by Indians for ceremonial purposes during the Woodland Period at least 1,000 years ago. Rock Eagle: Rocks piled to a height of 10 feet form an effigy of a soaring bird 102 feet long from head to tail and 120 feet wide from wing tip to wing tip. The quartz rock effigy mound probably served as a ceremonial center for Indians in the surrounding area. A tower overlook is adjacent to the effigy, located 9 miles north of Eatonton on U.S. 441/129. Kolomoki Mounds: Seven earthen mounds within the park were built between 250 – 950 A.D. by the Swift Creek and Weeden Island Indians. The mounds include Georgia’s oldest great temple mound, two burial mounds and four ceremonial mounds. The park’s museum is partially situated inside an excavated mound, providing an unusual setting for viewing artifacts and a film. Funk Heritage Center: The Funk Heritage Center focuses on the history and art of the Southeastern Indians and European settlers.Through artifacts, exhibits, dioramas, and interactive computer programs, the Funk Heritage Center interprets 12,000 years of Native American history and the pioneer experience in the Appalachians. The centerpiece of the museum is a prehistoric petroglyph stone. Georgia Capitol Museum: Located in the State Capitol in Atlanta, houses exhibits and artifacts from all archaeological periods. Newly designed pre-historic exhibit on the fourth floor. Includes an amazing statue of a chief from the Etowah Mounds site. Track Rock Gap: A fifty two acre archaeological preserve, Track Rock Gap, contains four petroglyph boulders. Carvings resemble mammal and bird tracks, human footprints, and a various geometric designs. The petroglyphs have been known about by the Cherokee at least since the 1800s, and incorporated in their sacred beliefs. The site is thought to be of ancient origin. Fernbank Museum: As an overview of Georgia’s prehistoric human inhabitants,First Georgians focuses on the chiefdoms of the late prehistoric period (C.E. 900-1540). The exhibition explores the various cultures of this period throughout the entire range of Native American occupation within the state (11,500 B.C.E. – C.E. 1838). Fort King George: This site, on the river bluff, had been used by Indians for over 10,000 years. The lower bluff on the Altamaha River was occupied by a succession of Indian groups, was later inhabited by the Spanish missionaries, and eventually became a British fortified outpost in 1721. The museum at the site relates the story of the Indian as well as the Spanish, British, and Scottish generations of Americans.